Hey guys and welcome back to my blog! 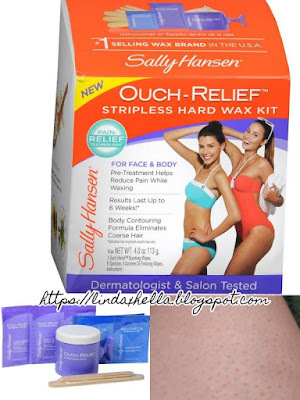 Today I am bringing you a review of the Sally Hansen Ouch Relief Stripless Hard Wax. Man that’s a long name! I bought this at Walmart for around ten dollars. I made the decision to buy this particular wax, because it was the only Stripless kind that had. I am the kind of person who likes waxing over shaving, because you stay hairless longer. I don’t think it hurts, maybe a little pinch is about all the pain I feel when waxing. Upon first impression I noticed it had a very slight scent to it. Most likely from the oils in it. Compared to the as Seen on t.v. purple wax, this stuff heats up super fast and an spreads really fast and smooth. The fact that it heats so fast is good and bad. It’s quicker but then again when I had to warm it back up, I took my eyes off of it for maybe ten second and it overflowed and made a huge mess. After that. I couldn’t use it anymore because it was a huge mess. Once the wax has set a few days I’m going to try scraping it off of the container and see if I can use what’s left. Overall the Sally Hansen Ouch Relief Wax does work well. I didn’t use the ouch relief Numbing wipes, I personally don’t need them. They contain 6% benzocaine, you wipe the area down and leave the solution to dry for ten minutes before waxing. How it says to use this wax like is to put on a thin layer going with the direction of the hair. Let the wax cool for a minute and pull it off going against the grain of your hair growth to insure you’re pull the hair out properly. I had a few hairs that didn’t want to come out, so I reapplied wax to that area and did it again, which worked wonderfully. If you leave the wax on too long, it cools too much and doesn’t pull the hair out very well. That happens with all waxes though, just to note. Initially when I first pulled the wax off, my legs felt really smooth. There was some redness where the individual hairs pulled out, but that went away within a few minutes. I waited to write this for a week so I could really check hair regrowth. So far I am still hairless! Which makes me very happy. I’d honestly recommend the Sally Hansen Ouch Relief Wax to newbies, and people who are use to waxing. It works very well and doesn’t leave a sticky residue. Just in case you have some residue left behind, it does come with Azulene oil wipes that sell really good! I hope this review has helped you out and helps you decide when buying wax for your next pampering night in! The results were awesome! If you enjoyed this post, please feel free to share it with friends and family!